South Korea must increase its efforts to enforce laws against bribery of foreign public officials, as enforcement is weak in view of the size of the nation’s economy and its export-oriented nature, said a report released Thursday by the Organization for Economic Cooperation and Development. Korea’s rapid economic development has been largely export-led, with exports accounting for nearly half of the Korean GDP. In 2017, Korea was the sixth-largest export economy globally. Four of the five sectors that the OECD identified as more prone to foreign bribery risks -- construction, transportation and storage, information and communication, and manufacturing -- account for a significant proportion of Korean exports. Foreign bribery cases have occurred mainly in the construction and transport services sectors, according to the OECD report, as well as in the technology, mining, services and telecommunications industries. The report said from 1999 until 2011 there were nine foreign bribery cases, resulting in sanctions against 13 individuals and three companies. Since 2011 there have been four foreign bribery cases, resulting in sanctions against 12 individuals and six companies. “This suggests a concerning lack of efforts and capacity to detect this crime and that much could be done to improve the detection of foreign bribery,” the report said. The OECD said the majority of foreign bribery cases in Korea were brought to the attention of law enforcement authorities by foreign authorities or through reports or complaints from business partners or competitors. Of the 13 foreign bribery investigations since 2013, five were brought to Korea’s attention by foreign authorities. “Korean law (also) does not contain provisions to reward self-reporting of irregularities by legal persons generally, although self-reporting may be taken into account generally as a mitigating factor in sentencing for any offence,” the report said. 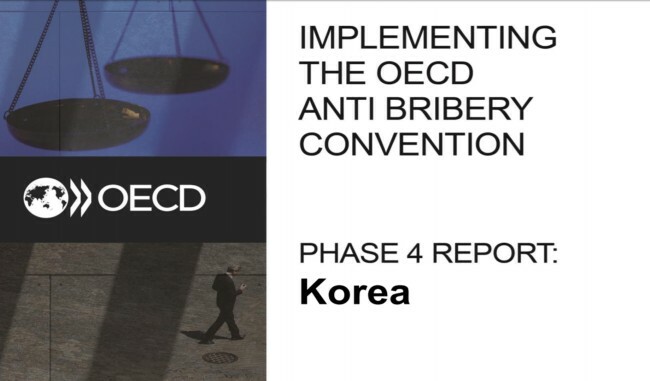 The OECD urged Korea to be more proactive about detecting and enforcing its anti-bribery legislation and to take action promptly. Furthermore, according to the OECD, Korea needs to address key elements of its legislative framework -- in particular, to increase the level of sanctions for foreign bribery and to ensure that the application of its foreign bribery law is not subject to a restrictive interpretation by its law enforcement and judiciary.